We have been glued to the weather, watching the temps drop, waiting for the snow to fly. Finally the temperature and humidity have aligned and as I write this, resorts across the state are cranking up their snowguns and pumping out the white stuff. Located in the western UP, Ski Brule has been open since the Thanksgiving holiday. Another UP location, Norway Mountain is slated to open December 11th. A view of the webcams at Marquette Mountain show signs of life and signs of snow from their equipment as well. Moving down into the LP, both Boyne Mountain and Highlands started up their machines again in an effort to assist mother nature. A quick glance of the webcams at Nub’s Nob shows snow piling up. Shanty Creek Resorts also kicked on their equipment today at both Schuss and Summit. Currently they are shooting for opening Schuss on the 11th and Summit on the 18th. Let’s hope these cold temps stick around and the snowmaking can continue! Crystal Mountain flipped the switch on their fleet of snowguns tonight in hopes of assisting the large storm projected in the forecast. This is what December should look like. 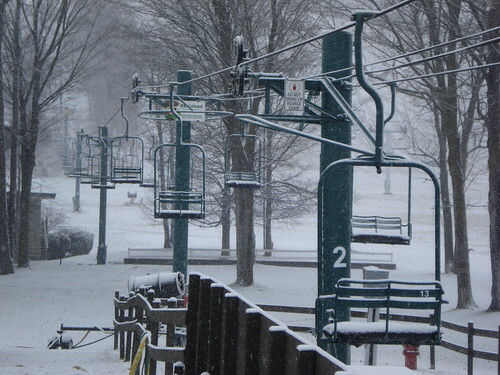 Boyne also got a jump on the season at both the Highlands and Mountain. Jason, I just got a tweet asking about deals at Boyne Highlands and Nub’s Nob. I checked the Traverse Magazine Ski Guide which indicated that Boyne Highlands offers 6 lift tickets for the price of one on December 18th to celebrate its six-person chairlift. And Nub’s Nob has weekday eve lift tickets for $28 for adults and kids $24-20. Have you heard of anything new? Correct Rachel! Boyne is also offering up Free Frequent skier/rider card with two nights stay from December 17th to 19th. There are some great perks for having one of those! In addition to the weekday eve tickets, Nub’s Nob now has a free beginner area with its very own double chair – all free!